Purchase tickets online for FASO's final concert of the 2018-2019 Concert Season featuring Organist Monica Czausz. "What an amazing organ! It is a thrilling installation!" Subscribe today for FASO's 13th Concert Season! British born, Carol was raised in a Welsh family with many musical influences and began private lessons at age five She began performing organ recitals at age eight. FASO is thrilled to welcome Amarillo’s nationally acclaimed soprano, Suzanne Ramo to perform the third concert of the FASO 2018-2019 Concert Season on Sunday, March 17, 2019! 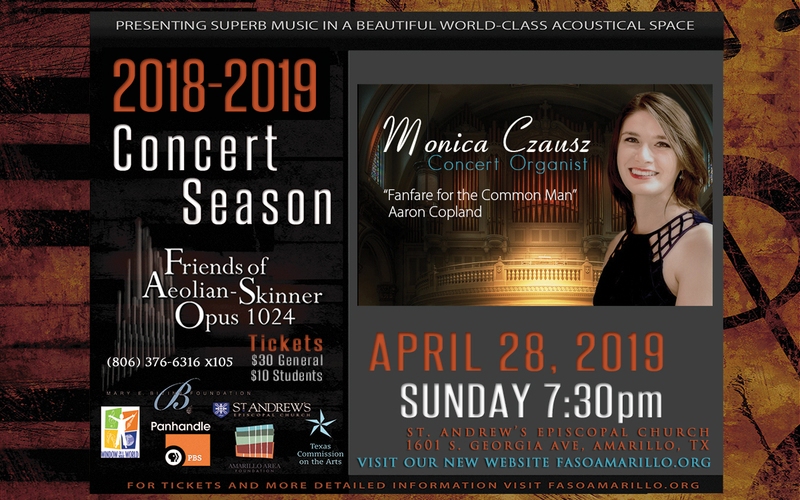 The brilliant young rising star concert organist Monica Czausz presents the finale concert of the FASO 2018-2019 Concert Season on Sunday, April, 28, 2019 at 7:30 pm.